me 3!!!!!!!!!!!! if its a bad role, i think i would be fine cause i dont like them. if one of the leads the show, i think i have to think a few times about watching. no offence snsd fans! turn a pretty girl normal what i care more about is their acting skill. know who going to be the korean makino. but ahhh i'm excited for this! out of the four, it seems like only 2 fits the role really well. i think im gonna like rui in this drama more than tsukasa. oh well, we'll wait and see how it turns out. 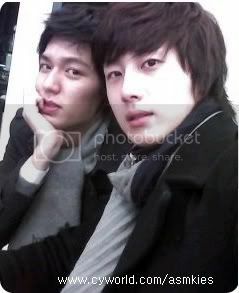 I found a pic of lee min ho with jung il woo! i remember lots of people wanted him too! this is the official thread about HYD korea? or just the casts? because i found thread about F4 in korean celeb photos too..
BASICALLY the staffs went to MACAU to find location for the Boys over Flower filming. Goong's last episode took place in Macau the Macau Tourist Association asked Group 8 to consider Boys over Flower filming location to take place in Macau Venitian..just like for the East of Eden,, lol.. because after Goong was aired alot of asian tourists visited Macau that year. so Macau was thankful to the production team ( thats what it said in the staff diary). he wrote " I wonder after " Boys Over Flower" airs, what Macau will bring to the viewers this time." So excited for this, I actually don't know any of the actors playing the F4 (except that kid from EOE) since I'm pretty new to kdrama's and still getting introduced to most acotors & actresses. Looking forward to who will play Makino, also. Forgive me for not going through the last 7 pages - to see if this was answered - but does the drama have a release date yet? This is news from daum! I wonder who is the girl? Really curious. Hmm.. someone around their age? >.< OMO! omg. there will be this remake of another japanese manga and drama. dragon zakura. it will have the same timeslot as hyd as well as eoe. and poor me, i plan to watch all. err and the drama will have cast from boy and girl bands. ohno. the ratings. which will get the highest? i think it will be eoe though. all I need to know now is the girl... Tsukushi! Ooh and Sakurako? out of the 3 shows, i think eoe will do best. basically because korea is an ageing population? ahjumas and ahjusshis will watch eoe? because after they come home from work they would relax and watch eoe. but teenagers, in korea, alot of them study night school too. and therefore only those crazy fans of kim bum, hyun joong and so on will watch hyd. and same thing for master of study. but those teenagers that are not that crazy wouldnt have time to watch. and i think eoe is the next jumong. i am loving eoe and i think it will be the best among the 3.
storyline, casting and so on..
i think master of study, i am not sure, i think it will be the worse. most singers cant act, we have to accept that fact. i am more to kpop but i strongly object to having idol dramas! but i really hope hyd will do better than master of study. Now I wanna see how this Lee Minho will do the crazy antics of Domyouji whenever he's giddy about Makino. Jumping on couches and acting all smiley anyone? Haha. Plus Domyouji here must have really bad Korean comprehension, won't he? A little on the 'baka' side since he always take things literally. OMG!!! I was so DAMN happy when I heard that Hyun Joong was going to be part of this! I can totally see him as RUI!! LOVE KIM HYUN JOONG FOREVER! I just rewatched I Am Sam on DVD, from the episode where Lee Min Ho appears, since I wasn't able to finish it before. I must say, he's a perfect choice. He totally has the "big and bratty rich heir" aura and even has the "baka" facial expressions down! I get the impression that he's a mixture of Jerry Yan and Matsujun. Plus another thing going on for him is that he is not as high profile as other young actors, which gives him a lot of room to conjure an image.